The fact that many stakeholders of Commerzbank and Deutsche Bank are opposed, or at the very least skeptical, of a "merger of weakquals" involving the two German banks has been widely known for weeks, if not months. But now, it appears one of these groups is trying to sabotage the deal by pushing for an extraordinary meeting of the bank's supervisory board. According to Bloomberg, which cited reports in a German trade publication, Commerzbank's powerful labor representatives, who control half of the seats on the bank's board, are opposed to the deal, and are seeking to formally quash talks over fears that the 'synergies' produced by the merger could lead to the loss of thousands of jobs. No meeting has yet been set, and whether the labor reps would be able to find an ally among the bank's shareholders is still unclear. But according to the report, if the labor reps succeed in killing the deal, they might not stop there: Word on the street is that they are also fed up with Commerzbank CEO Martin Zielke, who has been pushing fort he merger, trying to convince staff that it would be a good plan to quickly increase market share, and are actively trying to oust him. A spokesman for the bank denied the rumors, but one of the board's labor reps has said that he would love to see Zielke thrown out. "Rumors and speculation on personnel changes are made up out of thin air," Commerzbank Supervisory Board Chairman Stefan Schmittmann said by email. "Such allegations are irresponsible and unworthy of discussion." 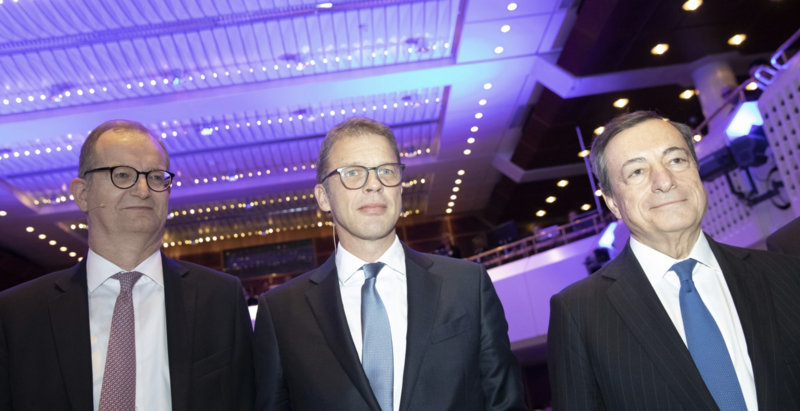 "I won’t shed a tear" if Zielke were to step down as CEO, Commerzbank supervisory board member and labor representative Stefan Wittmann said on the sidelines of an event in Berlin. Wittmann, who is employed by the Ver.di union, has emerged as one of the strongest voices opposing the deal. He coordinates his work closely with Ver.di’s main representative on Deutsche Bank’s supervisory board, Jan Duscheck. On the sidelines of the Berlin protest, Duscheck said labor representatives on the boards of both banks are united in their opposition to a deal. If the labor reps succeed in calling the meeting, they would then need two majority votes to kill the merger: one to get a motion on the agenda to end the talks, and another to adopt it. But as if the resistance of Commerzbank workers (who could be joined by Deutsche employees in their resistance to the deal) wasn't enough, other powerful stakeholders have expressed apprehension about the deal. Christian Sewing, DB's CEO, has pursued it only reluctantly, and now top ECB officials have reportedly "questioned the logic" of the deal, adding that the regulator doesn't see how the tie-up would put the banks on safer footing. The central bank had previously said that Deutsche would likely need to raise buffer funds for the merger, creating another potential stumbling block. Several members of the European Central Bank’s supervisory board questioned the logic of a merger at recent meetings, said the people, who asked to remain anonymous because the deliberations were private. Officials are concerned that the ECB’s credibility will suffer a major blow if they approve a deal and the merged bank then runs into trouble, they said. This essentially leaves the German Finance Minister Olaf Scholz as the only major stakeholder who is pushing for the deal, in the hopes that it would create a "national champion" more capable of servicing Germany's major industrial exporters. Even investors are apparently opposed: Both DB and Commerzbank shares rallied on news that the deal might be as good as dead. If the plan is killed, either by the ECB or labor unions, then Scholz would have only one clear option for creating the German superbank of his dreams: Outright nationalization.